Many years ago… before I ever saw Texas HS football firsthand. I coached on a staff in Reno with a Texas transplant. I really liked the guy, but my main memory of him was a perpetual look at amazement and disgust at what passed for high school football in the boonies. Pretty much anywhere outside of Texas, from his perspective. “Y’all don’t have a filming tower/a real pressbox/ one-way coaches or players…?” He would always ask in frustration. He lasted a year, before moving back to Houston. I felt the same way after my year in Texas. You get accustomed to what you’re around quickly and it took a while to readjust to Nevada ball after seeing the sport in Texas. Tonight I got to watch one of my old teams, Cedar Hill, on ESPN. (They beat De Soto, 65-42!!) It was great to see familiar faces on national TV, but even more, it reminded me of how special Texas High School Football is. It is just a completely different thing than what I coach in Reno. The bands playing during the action, the big crowds, returners bringing the ball out of the endzone…more than anything, the amazing quality of play. When Big and Bright comes out next August. You can read all about it!!! I love the kids I coach now. Reno is a great place to live. Between the mountains, the climate and my family, I can’t see ever moving. 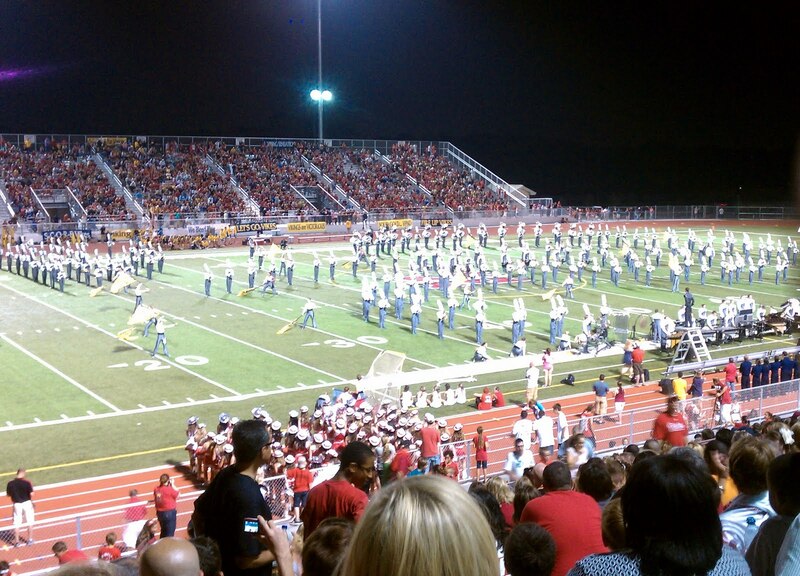 But for high school football, there is no place better than Texas and I miss it. My German team started practice this week. Although I’m 1000’s of miles away, don’t speak the language and am coaching another team, thanks to Facebook, Europlayers and Hudl, I’m already hard at work. We are looking for a quarterback, and the main way this is done is through Europlayers, almost like a dating website, connecting interested players with teams worldwide. Players profiles all have video clips imbedded, so a coach can search for particular position players, watch film and contact them all through this one website. Monday, I spent several hours evaluating QB film and talking on a Private Razorback Coaches group on Facebook about who is worth pursuing. This week, on Facebook, I communicated with a coach on the German staff about a drill I wanted him to implement. Tuesday, I filmed this drill with my HS team in Reno and used Hudl to send it to him. Wednesday, he added his notes of coaching points to the clips and sent them to the German players. Later that evening he ran the drill and sent the video clips to me in Reno. This morning I added MY notes to the drill about things I was done well or poorly, notes that will be seen by my German players who I won’t meet in person until March. For a coach who still remembers actual film projectors and mimeograph machines, the added efficiency technology brings to football seems like magic and, I think, is a big reason programs in places like Europe have grown so quickly. It’s a different world, maybe worse in some ways, but things like this are pretty cool. Last week I finalized a coaching deal in Germany to be the offensive coordinator for the Ravensburg Razorbacks. The deal includes a round-trip flight, room and board, use of a car and a few Euros a month. The team is made up of local German adults and a few Americans… usually former college players. The pay is nothing big, but it should be a amazing experience. As the Germans play during Spring, I’m heading over in March and returning to the US in July; in time to coach my high school team and for the August release of Big and Bright. My first task is finding a quarterback… So if anyone knows a zone-read QB looking for an adventure, be sure to let me know! I intend to write a book about the experience and the entire Euro Football scene. I think it will be amazing to see the sport in its emerging state, through the eyes of people who are just learning about it. To participate in its growth from the inside will be even better. Stay tuned to this blog next year for frequent updates from Europe. Other news- My NFL boycott lasted about as long as it took me to write my last blog entry. Even with its many flaws, even at its worst, the NFL is like a car-wreck, impossible to not stare at..also, the 49ers started winning again. We have a bye week coming up, so I had the opportunity to travel to the Bay Area and see my 1st 49er game live in almost 30 years. The new stadium is very nice, but I found myself missing Candlestick. The PA system is incredibly loud. It’s almost impossible to talk when they crank up the music during the annoyingly frequent TV timeouts. Its very hot. Santa Clara is much warmer than San Francisco and the stadium has no shade for maybe 75% of the seats. This is going to be a problem in September and October every year. The crowd has become yuppified. 30 years ago, Niner crowds were rough, drunk and mostly blue-coller. I guess most of those people have been priced out of the modern NFL. No more Forty F*%&in’ Niners Tee shirts (spelled out and very common at the ‘Stick during the 80s) A You-Tube video of a bathroom fight during this game got a lot of play, but event like this are now very rare. I’m willing to bet fights like this happened every week in 1983, but without the internet to glorify them, they were all quickly forgotten. It was fun and worth going, but I have to say that if I had free tickets to an NFL team and lived nearby, I would still probably only attend a few games a years. It’s just too much trouble to deal with the crowds, noise and general discomfort when I can see the game better sitting on my couch. Good luck to all my friends in Texas, and let me know if you have a quarterback looking for a place to play! !